Our destination today was Cape Cod, still in Massachusetts and, according to Google Maps, a bit more than 2 hours drive from Cohassett. On that basis we had accepted the offer of a tour around the local area in the morning and did not hurry ourselves out of bed. Still we were a bit surprised when we noticed that it was already 7:50 and we were not up and about. We corrected that as quickly as we could and joined the family for breakfast. Helen had prepared small sausages and fresh blueberry pancakes which we ate with maple syrup and coffee. Sausages with sweet pancakes and maple syrup is not a combination we would expect to find in Australia but it worked well. Kerry’s sister arrived soon after breakfast, as did the contractors to begin painting the outside of the house. Once that had settled down Kerry left the boys with her sister and niece while she and Helen took Majella and me for a driving tour of the local area. We drove north along Jerusalem Road, past some large houses with ocean views, and around to the Nantasket peninsula where we drove out to the end from which Boston was clearly visible across the bay. It was an interesting drive on winding roads with views of the water in one or more directions for most of the way. The area had traditionally been one for summer cottages but many of those were being updated for year round living by people who worked in the Boston city area but preferred to live out of the city. 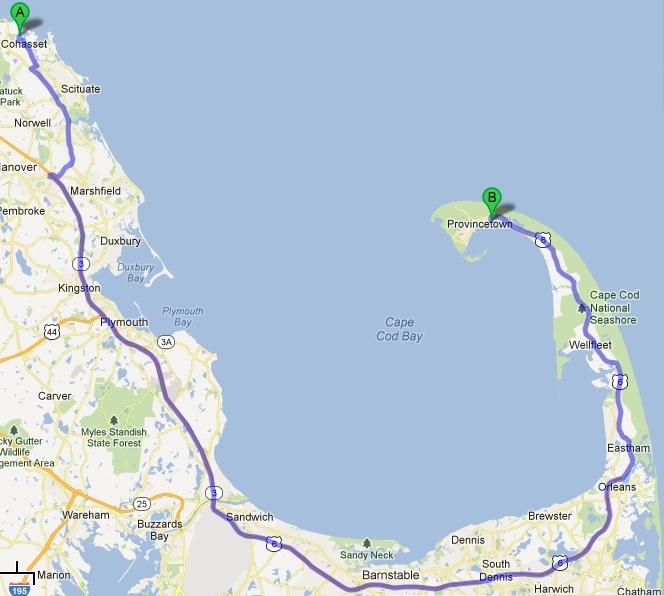 Access by car to Boston would require a long drive but there are commuter ferries that offer a shorter trip. The area would certainly have its attractions for those who like boating or other water activity and the views would make the extra travel more bearable. Before going back to the house we were driven back into Cohasset village and some other surrounding areas including the old harbour area where there is the remnant of an old grist mill driven by tidal flows and the top of an old lighthouse mounted in a foreshore park. There were more beautiful views of coastal inlets with houses hidden among the foliage. Back at the Grubers’ house we said our farewells and headed south to make our way to Cape Cod. Our hosts had suggested that we take some time on our way south to visit Plymouth, where the pilgrims landed from the Mayflower in 1620. We decided to make that our lunch stop and turned off the highway at the appropriate point. We found a metered space along the front just short of the park that houses the famous rock and the Mayflower replica. Thinking that a hour would be enough I fed the meter and we walked off to see the famous rock. We also looked at the local souvenir stores and what food might be available. Nothing in those stores appealed for lunch so we added 30 minutes to the meter (allowing an hour) and walked up the low hill to the village area. There was more on offer there and after walking up and down the street we settled on Persy’s Place where I had coffee with an open face turkey sandwich on pumpernickel with cranberry sauce. It was served with French fries and was good but much more than I would usually eat for lunch. Majella had a panini with spicy sausage and coffee with pumpkin spice. Now that she has tried the latter she feels justified in passing by further offers of pumpkin spice. Her sandwich was also filling, with sweet potato fries, and she later proclaimed it a bit oily. We finished lunch just in time to get back to the car before the meter expired. We drove on toward Cape Cod, stopping for a while at the village of Sandwich just after crossing the canal. One of the painters this morning had mentioned it and Majella hoped it might have a quilt store. It didn’t or if it did we did not find it on our fleeting visit. We stopped again at the Salt Pond Visitor Center and at Highland Lighthouse near Truro for photos before arriving at our hotel. Once we had checked in and dropped our bags we headed out to the Province Lands Visitor Center just out of Provincetown. We arrived just as the center closed at 5:00 pm but were able to spend some time on the observation deck above the offices. It had 360 degree views, mostly toward water and we were able to see whales breaching near a whale watching boat some way out in the Atlantic. From there we drove down to the beach at Race Point for a look and more photos. By that time Majella was tired and feeling the cool breeze so we headed into town to investigate the tall tower we had seen from the lighthouse at Truro and to find dinner. The tall tower turned out to be the Pilgrim Monument, built in the early 1900s to commemorate the pilgrims who landed in the Provincetown area and attempted to establish a settlement there before moving to Plymouth because of the lack of a good water supply here. We walked up the street and considered a few places, finally deciding on Bubala’s. Part of the attraction was that they had parking and offered some light options – neither of us needed much dinner after the lunch we had eaten. We had parked some distance away and the fee we had paid for an hour was not going to last through dinner so Majella went in and I went back for the car. We had decided on orders from the menu posted outside and by the time I got back Majella had ordered and the food had arrived – chowder for Majella with bread and a salad with Gorgonzola cheese, walnuts and cranberries for me. I added a beer and we finished dinner fairly quickly before heading back to the hotel. Distance today was only about 200 km. For some reason my tracking app on my iPhone lost track of us through the day and assumed we travelled in a straight line from the base of Cape Cod to Provincetown. That would have require us to drive on water. I hope it does better tomorrow.